How about a new design for a caboose besides the N5C porthole caboose? Not all railroads ran an N5C caboose. There are more than twelve differant designs for cabooses on the real railroads, even bobber cabooses. 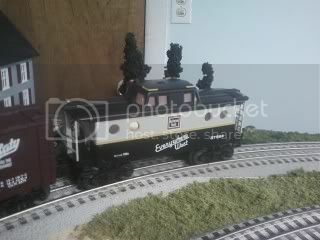 But in Williams O gauge we are limited to just one caboose design? Seems like another company will be getting my modeel RR $$, when it comes to cabooses!!!! I have to agree with Lee. I've been buying either Atlas O or MTH premier cabooses (cabeese?). A nice bay window caboose or SP style caboose would be great. My most recent purchase was a WbB Burlington caboose to go with my Lionel post war Burlington GP7. I think that it looks great!